... you can hear the sea. If I go near a Shell, all I hear is the sound money cascading from my wallet like water plummeting over Niagara Falls. So it's no shock to read that Shell Oil's European division made $9 billion (yes, that's a "B") dollars in profit in the first three months of 2008. And still no shock that today gas went up yet again. 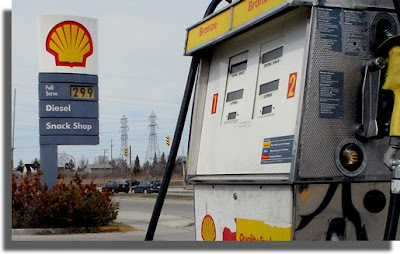 To a new high of $1.30 per litre. Since the Canadian and American dollars are about par right now, that's $4.92 per US gallon. Yeah, I may not be shocked. But I may need a defibrillator soon. I seriously want to buy a Vespa. If only I dind't have to drive on the highway to get to work. Isn't the price just outrageous?! Where I live in south/central Texas, we pay an average of $3.50 per gallon. Highway robbery! Where is Robin Hood when you need him? Now you know why we don't have a car. It is way to expensive and irresponsible. We would be fools to own one. Darla: Well, $ 3.50 is still better than nearly $ 5.00 / Gallon.. just wait. Yeah, they're sitting in the board room going "raise gas prices, nobody does anything, earn record profits...why didn't we think of this before?" I don't mean to be smug, but I saw this coming about 3 years ago and took steps to nullify it's effects. I sold my old house and moved downtown so I can walk to work. I have filled up my vehicle twice so far this year, so the cost of gasoline really dosen't effect me. Now, as far as all those saps out in the 'burb's that bought SUV are concerned....I don't have a lot of sympathy. It isn't like we weren't warned about this. They just weren't listening. Truly, it's just ridiculous. I'm stick of seeing the zeros at the end of their profits. Ours has just hit $1.23 here, but it keeps moving the wrong way. It's insane that the oil companies can continue to rake in billions in profits while we struggle to afford to keep our cars running. I'm starting to hear talk about an "excessive profits" tax. I think I would be in support of that. Whoa. that is a lot for gas. Right now we are at $3.75 a gallon in American. I don't know what canadian is...all I know about canada's money is I have a bunch in my pocket right now that the soda machine at work won't accept. Stumbled on to your blog from The Busy Dad Blog. Hope to join soon. VE: How true! And what CAN we do? Lotus07: Oh, us saps knew... it's just some people need cars too. I don't expect my dad with polio to ride a bike... I wouldn't mind so much if the oil companies weren't making record profits. That's the real crime here. Phoenix5: You and me both. Karen Meg: Yeah. It will be doubling in the next few years. Time to seriously look into a hybrid. Toners: We are all going thru it together... a monopoly even among various oil companies. I always get pissed every station upps their prices at exactly the same time, at exactly the same rate! It's fixed. And we're stuck. Mr. Zig: Ha! Yup. That sounds like the place! Jeff: I hadn't heard that up here in Canada. Yeah. Canada. The place with all the oil out west.... geez. True...there are those that have large families and the infirm that NEED a big vehicle to get around and have to drive long distances. Down here in the Southwest, I see legions of Hummers driving 90mph with 'one' person at the wheel.....I just don't feel their pain. They could buy a V-6 mini-van and be doing 55mph....but noooo. They are the 'saps'. My son (who lives in Dubai) was horrified when he saw the petrol prices here - £1.16 per litre! Over there it's so cheap!